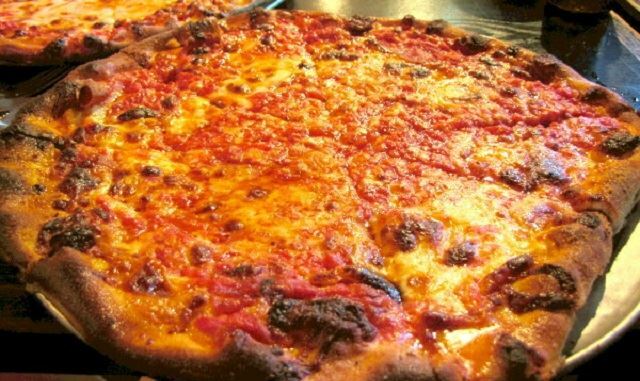 · Santarpio’s (111 Chelsea Street, Boston, MA, 02128): Known as the best pizza in town, Santarpio’s was founded as a bakery in 1903 and switched to pies of the pepperoni variety three decades later. The neighborhood has come a long way since the Boston Globe attested, “the average New Englander’s only knowledge of East Boston is the sign for Santarpio’s Pizza that can be seen from the highway on the way to the airport.” Lori says to also be sure to try the delicious barbeque skewers they cook on a pit at the bar—steak or lamb tips and sausage, too! Be sure to stop at the ATM on your way—Santarpio’s is cash only. · Ecco (107 Porter Street, Boston, MA, 02128): One of East Boston’s trendiest hotspots, Ecco is perfect no matter your mood. Brunch is a fabulous affair while the bar is home to martinis made with fresh fruit puree. Details like the bread served in cigar boxes and the decadent lobster mac and cheese appetizer will make this lounge ideal for either a first date or a dinner out with colleagues. · Rino’s Place (258 Saratoga Street, Boston, MA, 02128): Per Lori, this is the best Italian in all of Eastie! Best known for homemade pasta and Italian comfort food, the cheese ravioli is a must. Be sure to arrive hungry and early—the portions are huge and the line is routinely out the door! · Roy’s Cold Cuts (198 Marion Street, Boston, MA, 02128): Roy’s is a very popular neighborhood shop for sandwiches to go. But it’s so much more! This family establishment is also known for its quirky rock ‘n roll décor covering the entire shop and fun items for sale like penny candy. Whether you get the Meatless Wonder (breaded eggplant, fresh mozzarella, roasted red peppers, lettuce, tomato, basil, oil, and seasoning) or the Godfather (prosciutto, chicken cutlet, tomato, fresh mozzarella, roasted red peppers, seasoning and oil), you’re in good company. Johnny Depp was even inspired to drop by to grab a sandwich while in town filming Black Mass.